Aside from the, uh, problematic nature of an old white coach grousing about someone needing to put a stern, fatherly hand on the shoulders of his young, black players, Karl is doing nothing but telling on himself here. Carmelo Anthony and J.R. Smith were super talented players who sometimes had trouble committing to defense and taking smart shots? Hmmmm, if only an accomplished basketball thinker who’d seen it all had been making a lot of money to figure out how to reach them and help them fulfill their potential. If this was just about those two that might be one thing, but note that George Karl has never not clashed with the star players on his teams. Kendall Gill hates him, Ray Allen hates him, Andre Iguodala hates him, Carmelo Anthony hates him, J.R. Smith hates him, and DeMarcus Cousins definitely hates him. Crazy theory here: maybe George Karl’s inability to get along with his stars had nothing to do with those players’ fathers, and everything to do with George Karl. 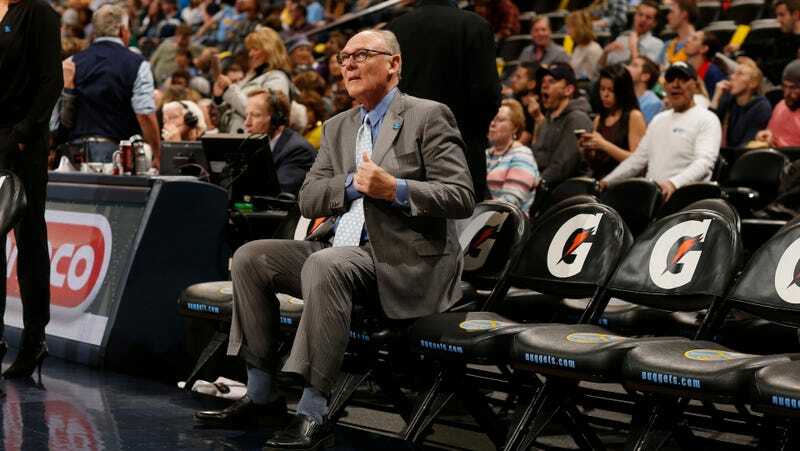 Rudy Gay To George Karl: "Welcome To Basketball Hell"
Report: The Kings Will Fire George Karl. Duh.